The most immediately visible characteristics that frequently seem to prompt both readers and critics to label a work of fiction “experimental” or “unconventional” (or perhaps just “quirky”) are the appearance of irregular sentence patterns, an apparent disregard for the expectations of realism (in literary fiction, at least) and a formal arrangement that can’t be described as simply identical with the narrative movement the work offers. 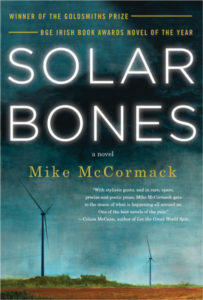 By this measure, Mike McCormack’s Solar Bones can be called experimental, although any reader who gives the novel a chance to validate its strategies is likely to affirm relatively quickly that these more adventurous qualities of the novel — adventurous, but not conspicuously “difficult” — do not ultimately make it inaccessible except to the most passive kind of reading. It is certainly the case that the prose of Solar Bones — ostensibly the narrative voice of the novel’s protagonist Marcus Conway, a middle-aged engineer from the west of Ireland — seems from the beginning especially fluid and open-ended, but eventually we become aware that it is composed of an unbroken, continuous sentence, an unfolding series of clauses (and the occasional list) loosely linked by simple conjunctions as time markers. Still, the sentence flow is modulated enough that the reader’s negotiation of their recognizable rhythms is really not radically different from assimilating a more rhetorically digressive style that nevertheless continues to observe the usual rules of punctuation. Likewise, the narrator’s account is mostly organized in something like conventional paragraphs, and while in this case the resulting units function almost more like stanzas and reflect the narrator’s heightened state of consciousness (for reasons made clear at the novel’s conclusion), they provide the reader with a largely unobstructed path through the narrative Marcus Conway relates, however meandering it does at times become. Although Solar Bones is quite meticulously realistic in its treatment of character and setting (an effect that is only amplified by our retrospective discovery of the origin of the telling), its uninterrupted prose might seem the sort of nonconventional practice that suggests a rejection of realist narrative, except that a moment’s reflection on realism as a literary effect should prompt us to question any such association of fidelity between writing that adheres to standard syntax and life as lived, the evocation of its local circumstances. To think that ordinary prose is the appropriate way to portray ordinary life is merely to commit a version of what the poet-critic Yvor Winters identified as the imitative fallacy, since there is no plausibly coherent connection between a “plain” style and enhanced realism. Indeed, given our ultimate discovery that our narrator is not exactly Marcus Conway but his recently disembodied spirit (following a heart attack), wandering his empty house and recalling his life, it is manifestly the case in Solar Bones that McCormack’s continuous prose is well-suited as the narrator’s mode of expression; it doesn’t merely “reflect” but in this case actually embodies the character’s condition as a being whose existence has been literally transformed into a phenomenon of language, a being who subsists purely as a narrative voice. Thus as well the novel’s kaleidoscopic formal arrangement finally seems the entirely natural result of the (supernatural) circumstances in which the narrator finds himself, not so much rehearsing the events in his life in their chronological sequence (as if assembling an historical record), but describing them as they appear now to his newly spectral consciousness. If Marcus Conway’s life is flashing before his (and our) eyes, it does so in discrete images and episodes, connected not by the narrator’s effort to reveal their meaning as whole, a composed narration, but by the narrator’s need to put them all together for himself, to come to some understanding of the situation in which he finds himself. In this way, the novel becomes a mystery narrative of sorts, although it is a mystery for the narrator himself to resolve, as the reader may not even be aware that there is a mystery to be resolved in the first place (no doubt many readers will suspect that there is more to the narrative situation than at first we are led to believe). Even so, the confirmation of Marcus Conway’s death at the novel’s conclusion doesn’t really bring clarity to a mystery story so much as retrospectively affirm the novel’s formal integrity. To point out the ways in which Solar Bones might be described as effectively unorthodox but not radically divergent in its formal or narrative strategies (readers looking for a “good read” can find it in this book if they are willing to accept some initial uncertainty and indirection) is not to say that this novel is finally too conventional after all, or that readers who actually do welcome experimental fiction (without necessarily applying a narrow definition of what “experimental” must entail) would find Solar Bones too timid. Indeed, perhaps the novel’s greatest value is in demonstrating that unorthodox writing strategies need not make a literary work difficult for a patient reader, while also still engaging the attention of more adventurous readers, who might also appreciate that, in the long run, writers whose efforts help make the designation “experimental” less intimidating have made a worthy contribution. Presumably not all readers and critics who resist experimental fiction do so because of an unshakeable attachment to linear narrative and plain prose. Presumably they seek in a work of fiction a satisfying and rewarding reading experience, which finally can be found in most adventurous fiction as well, but the reader must be willing to find it in a less routinized way than that offered by most conventional literary fiction. Readers looking for a character with whom to “identify,” however, could certainly find such in Marcus Conway. All of the novel’s stylistic and formal devices ultimately help to portray Marcus even more sharply, working to evoke his state of mind (or spirit, as the case may be) while also allowing us to consider his interactions with the other characters recorded in his account, often in conjunction with his work as a local government engineer. However ethereal we might have to judge Marcus Conway’s actual narrative presence to be, the encounters with politicians and crooked contractors are related quite materially through long stretches of dialogue that ring true to the talk of provincial officials and bureaucrats (although perhaps at times they become somewhat overextended) and that make Marcus’s presence in his daily encounters palpable indeed. His similarly corporeal talks with his son on Skype (the son is in Australia) reveal an apparently fraught relationship between father and son, while scenes depicting Marcus with his wife — including an extended episode in which he cares for her during a terrible illness — shows their relationship to be a strong but settled one, no romance for the ages but a successful and enduring marriage. Certainly Marcus Conway is not a heroic or “colorful” character. In fact, McCormack seems to be interested in him precisely as a more or less ordinary man whose life, and whose way of reflecting on it, is for that very reason worthy of consideration. with the sun high in the sky as the road ahead ploughed through the blue air, disappearing into the day’s depth along the lower slopes of Croagh Patrick on my right and the green sea to the left, such a vivid wash of light off the mountains that I recognised it immediately as one of those startling days when the beauty of this whole area is new again, the harmony and coherence of all its shades and colours washing down to the sea which was laid out like a mirror all the way across the bay to Achill Island and Mulranny, one of those days which makes you wonder how we could ever be forgetful of it because that is what happens, driving this coast road so often from Louisburgh to Westport, my morning route to work with its mountains falling through a chroma of blues and greens into the shallow, glaciated inlet of Clew Bay . . . Solar Bones seems a consummation of sorts, a satisfying synthesis of the themes, settings, character types, and adventurous inclinations found in McCormack’s previous books, which include the novel Notes from a Coma (2005) and the short story collection Forensic Songs (2012). Those books are certainly worth reading (especially the pleasingly weird Notes from a Coma), but Solar Bones is now the work that might plausibly put McCormack in the company of his great innovative Irish predecessors such as Joyce and Flann O’Brien. If McCormack’s novel is more a consolidation, a reaffirmation, of the tradition of Irish experiment than a wholly original extension of it, nevertheless readers open to a different but not formidable kind of reading experience should find it entirely rewarding.